Posted October 16, 2015 by Ian McArdell & filed under Books. Following his successful run of ‘Dark Eyes’ box sets, the Eighth Doctor returns for another series of linked releases. ‘Doom Coalition’ will unfold over four volumes, each comprised of four hour long tales. In Matt Fitton’s opener, an ill-advised prison visit results in the escape of one of Gallifrey’s most notorious criminals, ‘The Eleven’. As the expert, for it was he who caught the villain, the Doctor is recalled home. With Liv Chenka at his side, the Doctor finds enemies and allies in wait as he negotiates the political complexities of dealing with a Cardinal, the Castellan and the Celestial Intervention Agency. As he remarks, his return is usually greeted by guards bearing guns and this is no different. 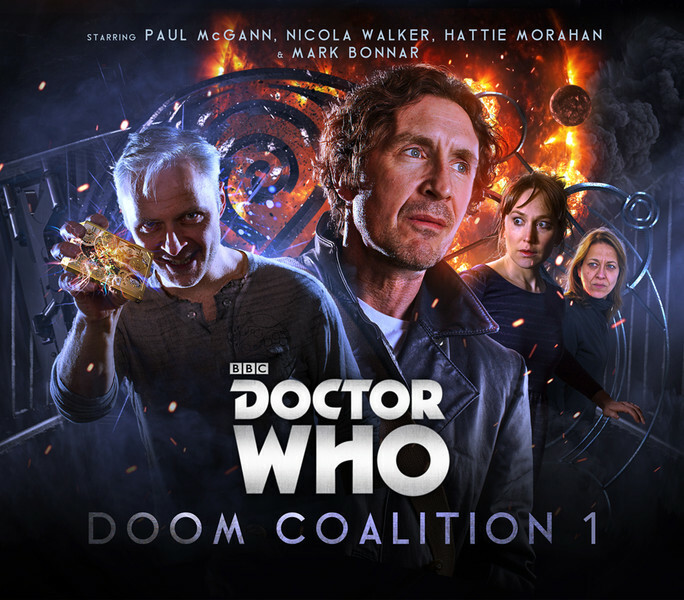 More than a match for McGann’s dynamic, passionate Eighth Doctor, Mark Bonnar (Line of Duty) plays The Eleven in all his regenerations. This renegade suffers an affliction which forces him to endure all his former selves at once and Bonnar gives a phenomenal performance, switching in quick succession as the differing personalities vie for attention and control. Away from Gallifrey on the hunt for a temporal anomaly, John Dorney’s ‘The Red Lady’ introduces the Doctor’s new companion; academic Helen Sinclair appears bright and practical, if deeply frustrated by her situation and 1963’s sexist attitudes. Hattie Morahan (The Bletchley Circle) is terrific and the sort of actress that the television show could only dream of casting as a companion! As for the Red Lady herself, we will say nothing more than that her manifestation is both cleverly done and bloody terrifying! Taking Helen into history, to her almost giddy delight, Florence is the destination for a meeting with Galileo – courtesy of Marc Platt (‘Ghost Light’). An old friend of the Doctor’s, the Renaissance polymath is towards the end of his life and under house arrest, but wise enough to understand his unwilling role in ‘The Galileo Trap’. Finally, there is a confrontation of suitably epic proportions, in Edward Collier’s ‘The Satanic Mill’, where the Doctor finds himself willingly walking into danger and confronting some long forgotten Gallifrey technology. Settled into her companion role, pragmatic Med-Tech Liv (Spooks star Nicola Walker) has mellowed a little, though she does retain her pleasingly blunt delivery and sarcasm. Together, Helen and Liv make a fascinating duo and we look forward to seeing the dynamic between them develop. Among the guest cast, Robert Bathurst (Cold Feet, Downton Abbey) impresses as the Doctor’s old friend Cardinal Padrac, and John Woodvine’s Galileo is a fantastic creation who we hope to meet again. There is also a pleasing cameo from Sylvester McCoy at the top of the tale. As the first four chapters of ‘Doom Coalition’, these tales manage to be enjoyable in their own right while still laying enough groundwork to leave us wanting more. Though the War Doctor may be on the horizon, it is clear to see there is plenty of life in the Eighth Doctor yet! Released in October 2015 by Big Finish. > Buy the box set on Amazon. It IS proper Doctor Who and it always has been. yes, but still give him a tv series! I know I’d watch it if he got one. I’m sure it would be great! Whether that should happen… that’s another matter entirely; a good question for another day. Alas, it’s not to be. Instead we get #Class. Considering the BBC barely give us one series of Doctor Who a year, why do you think they’ll be likely to give us another expensive series with an old Doctor? Especially as there seems to be a lot more interest in the New Series than the Classic, sadly. Oh, and let’s be honest: as good as the TV series is, the audio series is better. Better writers plus no budgetary constraints go a long, long way.